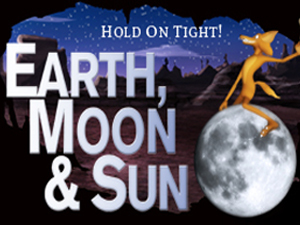 Explore the relationship between the Earth, Moon and Sun with the help of an amusing character adapted from Native American oral traditions who has many misconceptions about our home planet and its most familiar neighbors. How do the Earth, Moon and Sun work together as a system and what is the myth and science behind it? Why does the Sun rise and set? Why do we see different constellations during different seasons? What is an eclipse? Learn about the Moon's phases and orbit. Explore past and future space travel to our Moon and beyond. Family Audience/ Children 6yrs and older.